Liliana Cardozo makes an attempt to steal the ball at the last home game of the season against Cedar Valley on Oct. 24. The Eastfield Harvesters soccer season ended with a 2-1 overtime loss to North Lake in the Metro Athletic Conference semifinals on Oct. 30 at Richland College. After falling behind 1-0, Eastfield tied the game with a minute to go in regulation on a goal by freshman midfielder April Rodriguez. However, North Lake scored the game-winner in overtime to advance to the MAC championship game. The Harvesters managed only two shots on goal for the game. 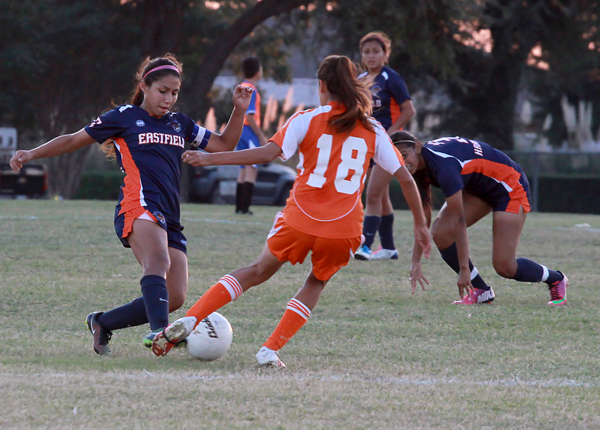 Eastfield had played North Lake to two 0-0 ties during the regular season. Coach Dustin Stein said the two teams were evenly matched and played a similar style, but he was proud of his team’s effort. “Not many people thought we would have success this season,” Stein said. The Harvesters’ roster included just two players from last season’s team. That won’t be the case next season. With 14 freshmen on this season’s team, Stein is excited about the possibility of coaching an experienced team next year. The Harvesters ended the season with a 7-8-3 overall record, including a 6-2-2 mark in conference play. The Eastfield Harvesters closed out the volleyball season with a 3-0 loss to top-seeded Brookhaven College in the Metro Athletic Conference Tournament at Farmers Branch on Oct. 24. Freshman setter Brooke Barajas had 10 digs and 15 assists in the loss while freshman libero Mikala Turner added 16 digs in the loss. Freshman Megan Murphy ended the season with a team high 228 kills and 25 blocks for the Harvesters, while teammate Mikala Turner led the team with 345 digs. Eastfield ended the season losing five out of its last six games. However, with only one sophomore on the team, the Harvesters could a more experienced squad return to improve upon this season in 2015. Eastfield finished the season with an overall record of 7-17 and a conference record of 5-6.